Strong grip, loose hands, keep my head still, club head outside of my hands, balance, tempo, posture, alignment, railroad tracks, inside – out, outside – in, draw, fade, where is the wind….and on and on. Sound familiar?? I would be willing to bet it does to most of us. We have so many things going on inside our head that we forget to actually focus on anything which leads to counterproductive practice sessions. I can’t tell you how many times I have seen golfers banging golf balls so fast that they actually get worse. Next time on the range try this! Pick ONE swing thought or goal for your practice session. 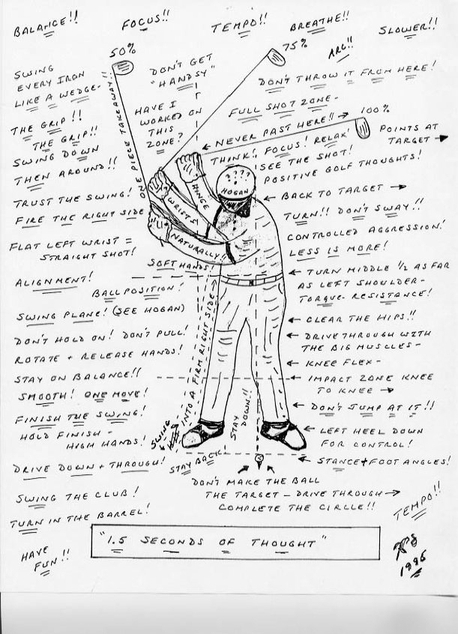 One mechanical swing change or feel that you are working on, just focus on that. Use a “block” practice method (see earlier post) until that change is more consistent and then switch to “random” practice. As the change becomes more routine and part of your natural swing think Balance. Start your swing in balance and try to finish in balance. Example: If your weight is on your heels, your momentum will take you to your toes on your finish. Balance is one of the things you can adjust and focus on while on the golf course, mechanics are very hard to change and adjust while playing. Always remember we are trying to practice what we do on the course but how often do you practice “Balance”.